I have been promising you my mother-in-law’s recipe for stuffed cabbage or “golubtsy”, which was her mother’s recipe for stuffed cabbage, for ages but do you know what is even sadder about how long it has taken me to get to this? That if I remember correctly, I jotted this recipe down on a page from my planner (a planner! with pages in it! many moons ago, my friends.) while sitting in the back seat as we drove to check out some wedding locations. Alex and I got married in 2005. And really, I have all sorts of places to blame for how long it has taken me to actually make the recipe at home. The first is Neptune on 1st Avenue, only my favorite place to sit outside for beers in the summertime and if you think that stuffed cabbage can’t taste good after a few Polish beers on a warm night, you obviously haven’t tried it yet. (With a side of kielbasa and pierogis, thank you.) The second is Veselka, also in the East Village — this is where I go for my winter stuffed cabbage fix. (Also cabbage soup. Small hands… smell like cabbage. Nobody else gets that, do they?) And the third is Alex’s mom herself, who often brings us extra that she has made, rendering it completely unnecessary for me to make any effort whatsoever to decipher my four year-old notes. Alas, this week it brutally cold and officially Time to break it out. And of course my notes made no sense but fortunately with some phone counseling I think I did alright for a newbie. What I forgot to do — dry the cabbage leaves — led to a too watery sauce and also I under-seasoned it — I hate that. But it’s not like you could test uncooked beef. — and yet it was still totally delicious. And I love it when I try to break recipes and they still come out well. I consider it a good omen. Cut the core out of the cabbage but leave it whole. Place it, with the empty core area facing up, in a large bowl. 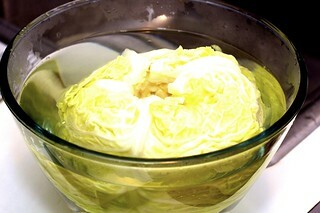 Boil a small pot of water and pour the water over the cabbage and let it sit for ten minutes. Heat the oil in a saute pan. (I like to use the large one I will cook the final dish in — a deep 12-inch saute pan — to save dishes.) Cook the onions until they are soft, add the carrot, celery and parsnip and saute them for a couple extra minutes — until they are also soft. Season the mixture with salt and pepper, transfer it to a bowl and let it cool a bit. Mix in the meat, rice and tomato paste and season again with salt and pepper. Drain the head of cabbage. Pull off large leaves, cut out the large vein — if the leaf is very large, you can make two rolls from each, if it is smaller, you can cut the vein out partially and pull the sides to overlap before you roll it into one roll. Pat the leaves dry with towels. Roll about 1/4 to 1/3 cup of filling in each leaf (depending on the size of your leaf) and arrange in a large, wide pot. Pour in enough juice or sauce to cover the rolls. Bring to a boil and reduce the heat, letting them simmer covered on the stove on low for about 45 minutes. Serve immediately. If sauce has thinned a bit, you can heat up any additional sauce you didn’t use and pour it over as you serve the rolls. I read this on eGullet somewhere, I think, but I remember a chef suggesting that you take a bit of the meat (which is easy to do since you’re using mince here), sticking it on a plate and microwaving it. The texture won’t be right, but you should be able to taste for seasonings that way. May – I do that with any meat mixture I am making for meatballs, stuffing, etc. I make a tiny patty and saute it to check for seasoning – especially for salt. Oh how I miss my grandmother’s stuffed cabbage. She made it for Rosh Hashanah, and it was Jewish style, stuffed with meat and rice, but with a cinnamon stick and crushed GINGERSNAPS!!! The sweet way with raisins too! Have you ever heard of that one? in a tomato sauce. It was my favorite. I have never attempted it. I am so glad that you mentioned these freeze well. We have my father-in-law for dinner every Sunday. My hubby and father-in-law love anything cabbage- but they’re the only ones. I think I will make this for them next Sunday and put the rest in the freezer. Perfect! And I just may have to try it as it is filled with such yummy stuff! This looks absolutely delicious. I’m definitely going to try it. Thanks for the laugh with the Austin Powers reference! Would a garlic clove and maybe 1/4 cup of parmesan be out of place here? What kind of rice are we talking – brown, long grain white, “quick cooking”? I wonder if we can substitute quinoa since it cooks just like rice but has more protien? I’m going to put this on next weekend’s menu! I’ve cooked cabbage rolls Scandinavian style: filled with rice, shredded cabbage and ground beef. Thanks for the idea to switch things around a bit, and use veggies and tomato sauce. Cabbage rolls are usually under-appreciated , they are really good and worth the work! mmm… these look fantastic!! I’ve never had cabbage rolls so I’m looking forward to trying them. Wow I’ve never been to Neptune on first ave…perhaps I’ll give it a try! My nana makes awesome cabbage rolls, but they are called halupki and slightly different. They add sauerkraut to the tomato sauce and don’t include carrot or parsnip in the mix. Soooo good. I keep looking for large heads of cabbages in the Farmer’s Markets down here, but they’ve been too small all winter. Though nana would kill me if I made someone else’s recipe, I think that the addition of veggies in the mix is something worth trying. I just woke up and am still pretty groggy, so I was so confused when I saw this. My fiances name is Alex, I posted version of his (Hungarian) mother’s stuffed cabbage in November, and when I saw your post, I was like what? Who made Alexs moms stuffed cabbage?? Anyway, yours look delicious, I might try grating the veggies next time. These are “go? ?bki” in Polish. I made them hundreds of times with my mom when I was a kid. Yours look really impressive!!! May I ask, from where does your mother-in-law come from? It also helps to put a heatproof plate on the cabbage and press it down before you cover the pan and leave everything to simmer — to weigh the cabbage down and keep it compact and under control. I find it incredibly difficult to stuff cabbage and vine leaves elegantly, so my hat off to anyone who’s got the knack. Oh Austin Powers, what a good laugh. Haven’t heard that phrase in long time! Never tried stuffed cabbage, shame on myself being Polish and all. My aunt makes such lovely cabbage rolls, I don’t think hers has veggies though. Since leaving home I’ve not had any (as she used to routinely bring extra to my parents). I’ve been looking at the cabbage heads in our supermarket longingly the past while, I think I might try this! With the addition of garlic. My life is not complete without garlic. heh. And it’s really good to know they freeze well as it’s just the two of us! I’m glad you finally got the chance to make these. They look great! My Hungarian MIL sometimes adds a can of tomato rice soup to hers too. Weird, but very tasty. I’m wondering what kind of rice you used. Does it matter? Also, I love Stacey’s idea of adding cinnamon & raisins. That sounds really nice! Deb, I’ve never had stuffed cabbage before – but they look great. Question: how are they rolled… Like burritos, with one set of edges folded in and the other edges folded over? And the they just stay stuck together after cooking? Or am I missing something? Thanks! YUMMmmmmm. These are a staple in my very large Polish family. It makes me want to make them myself. Our ‘secret’ is to line the pot with bacon (just for flavor) while cooking. It adds a fantastic, smokey richness to them. We also freeze the whole head of cabbage for about an hour, then peel the leaves off before steaming them — it allows the leaves to come off perfectly without burning your hands. My grandmother uses a mixture of beef, pork and veal for the filling, but we ususally use whatever is available. Your pictures are gorgeous, by the way. Totally mouth-watering. I’ll have to try it with the veggies inside! It looks delicious! Stuffed cabbage is a very typically Egyptian dish — we make it here all the time and sometimes make it a bit spicy which is fabulous! Interesting…my Polish/Lithuanian grandmother has a recipe quite similar to this but we call them stuffed pigeons (don’t ask me why…). She substitutes condensed tomato soup (campbell’s) for tomato sauce/paste and doesn’t use parnsips. I love stuffed cabbage. We call it “piggies.” I’m also a fan of “fake piggies,” where you make meatballs out of the stuffing, chop the cabbage, put everything in a pan with the sauce and stick it in the oven. All the flavors, none of the work! Deb, I adore you, but this is stuffed cabbage sacrilege!! Being Romanian and having my own recipe, I of course assume that every other recipe is an abomination. Melrose probably had our version – sarmale. Boil them on the stove for half an hour, then finish them off in the oven until most of the liquid has evaporated. I eat them with gallons of sour cream and polenta, but I don’t think that the sour cream is traditional. I find it so fascinating how all of these (for me) comfort foods are make differently from one person/culture to the next. My family are very Ukrainian and our pierogies and cabbage rolls are different from most Polish ones. I even discovered that Canadian/Ukrainians do things differently still… My Aunts and Uncles would occasionally have family competitions to see who makes the best :) I always preferred my Mom’s cabbage rolls though… she uses rice, ground beef, bacon, and onion in the filling – that’s pretty much it but it’s OH SO TASTEY! She also cooks the onion beef and bacon first and then tosses in the rice just to brown it slightly. That would allow a person to check the seasoning too. Thanks for sharing and making my hungry! This is very, very close to my Mom’s recipe, something I haven’t had in years, unfortunately, due to both distance and her arthritis. She would also add some of the real link breakfast pork sausage to the pot and they would be come out oh-so-tender. and I think maybe stretched out the pot for a family of 8. Add some mashed potatoes and it’s dinner! Thanks for the memories! Oh, that third ingredient is an onion, right? The third ingredient is an onion — now fixed! Rice questions: Just general, everyday rice works — Uncle Bens, whatever you have. I am sure other varieties would work, but we just use the basic stuff. I now can’t find the question but: Alex’s family is from the Ukraine, so that would be the origin of this dish. Betsy — Yes, like a burrito. Thanks ACA — I’ll be sure to tell my mother that her recipe is a “sacrilege”. I love “golubtsy” and your recipe looks great. For a delicious middle-eastern variant of this, made with lamb and pine nuts, check out Luisa’s post on this (http://wednesdaychef.typepad.com/the_wednesday_chef/2007/03/lambstuffed_cab.html). These look hearty and delicious. Thanks so much for the new idea. My Polish wife cooks something very. very similar to this quite often. One day I’ll blog about it, but I’m sure it wont look as appealing as yours! I was just talking to a friend about how I don’t like cooked greens – collard greens, spinach, cabbage, etc. Truthfully, I’ve never had them made well or in a good recipe. I should make this for my mom, she loves cabbage. wow, this took me back. We use to eat these growing up. I love them. I guess I need to make some now because I’m drooling. I can’t find parsnips here at this time of the year (Spain), and I don’t think I’ve seen them around in the market for some years now. Can you think of any substitution? I’ve read most comments. I’ve tried Romanian and Egyptian style cabbage rolls, and they tasted different, though I loved both. I’d like to give Polish cabbage rolls a try too :-) Thanks for the recipe! Patri, since you cannot find parsnips in Spain at the moment. Wonder if you should try something else of the same texture, i.e., grated sweet potato. I haven’t tried it but could be interesting. This actually looks a lot like Dominican stuffed cabbage. We also do rice, tomato paste and ground beef in the filling, though ours has garlic. We don’t cook in in tomato sauce, just water, and we put whole allspice in the liquid. My Mom just boils the cabbage for a bit to separate the leaves. It’s one of my favorite foods, especially since it doesn’t get made that often. For some reason, I have been so wanting to try making cabbage rolls lately! I am definitely bookmarking this, thanks! Wow! I haven’t thought of stuffed cabbage in a very long time. Now, I can’t stop thinking about them. I’m off to the store for ingredients..
My mum does golabki in a similar way, however she fries the meat first and then adds some sausage/ smoked bacon to the filling. These bring back mouthwatering memories of last November’s trip to Eastern Europe. I had both Polish and Hungarian takes on golwubky that left me burstingly full but wanting more! This looks amazing and I’ll be making it soon. The Hungarian stuffed cabbage was covered in a paprika spiced sauerkraut that defied criticism and would have convinced any pickled cabbage non-believer. I stumbled on to your blog today and couldn’t stop reading! I love your writing/recipe/picture! Thank you for putting together such a wonderful food blog. Oh man! I do love cabbage rolls. The ones I’ve eaten aren’t an ethnic icon though. I just make my BettyCrocker porcipine meatballs recipe and roll the mixture into wilted cabbage leaves and simmer them in a tomato based sauce. I’m going to use part of Alex’s Moms’ recipe next time, the grated veggies part, and add it to my mix. Thanks, Deb. I haven’t had golubzy in years now; mum used to make them while I lived at home, but honestly I think they are a bit too much hustle :) However, there is something called ‘lazy golubzy’, don’t wag your fingers please:), which tastes almost the same and you don’t have to burn your fingers separating the cabbage leaves or wrap them! You just chop the cabbage leaves into large chunks, boil the same way as you do with the ordinary ones, make smallish patties out of the mince mix, then layer with cabbage and cook. I also make these, my grandmother’s recipe handed down from generations and I always like to see how other people make stuffed cabbage. My Great Grandmother who came here from Poland was unbelievable in what she cooked, and of course my father swears her Golabki were the best, even to his own mother! I try not to stear away from the recipe and always find that the cabbage ususally is the culprit, whether it is off season, not tender or too small. I think I will have to repost my recipe. I can tell you that I use a lot of kitchen space, a lot of time and a lot of pots for one final pot to cook them in! Yum! I grew up on these from my Hungarain grandmother (Bubee). She calls them ‘halupchkas’. I think she uses a drop of sauerkraut and brown sugar/gingerale? perhaps in the sauce. A mild mild pich of cinnamon perhaps in the meat. Don’t know exactly. This is a staple at our Jewish holidays. (then there is the humbler weekday hungarian dish of fried cabbage and onions mixed in with pasta called kapostasz . . . something). When I lived in Israel I grew to love the mediterranean version of this East European/Ukranian stuffed cabbage dish–the yaprach or yabra–it is vegetarian and delicious!!! Stuffed grape leaves or onions with a very lemony rice. Then there is the mediterranean (Syrian) meat version called kubbeh–yum!!! ground lamb/ crushed pine nuts stuffing wrapped by fried buckwheat! On Friday’s I always went to the open aired market in Jerusalem, to Zidkiyahu’s, for these gastronomic delights . . .
o–and I think one of the ‘secrets’ of the dish is freezing the cabbage leaves in order for them to hold together well. This looks like the perfect stuffed cabbage recipe! The last version I made was vegetarian with a lentil and rice filling. I just love savoy cabbage, I really prefer it to traditional green cabbage. I am entertained by all the debates over which ethnicity truly OWNS this dish . I am truly shocked, though, that no one has brought up the smash top 40 hit by the Schmenge Brothers, Yosh and Stan, aka the Happy Wanderers – “Cabbage Rolls and Coffee”! mmmh, looks great. i remember my mother making a variation of these a few times as i was growing up, i believe she used two kinds of meat and some kind of spice, maybe cinnamon (but it was not any kind of ‘authentic’ eastern european recipe). i go to veselka often, but i have never had their stuffed cabbage. i will remember next time. My mother-in-law is Serbian and she taught me her recipe about 5 years ago. It’s my husband’s all time favorite and I am delighted to have it. Our recipe differs in a few ways. Rather than cutting the rib out, we just shave the raised part off, leaving a whole leaf with no gaps to work around. The meat is a mix of 75% ground beef and 25% ground sausage, plus a couple handfuls of uncooked long grain rice. Diced sauteed onions, but no other veggies. 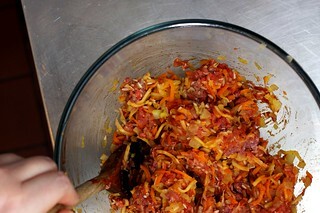 Tuck garlic cloves in amongst the cabbage rolls, and add saurkraut with it’s juice to the tomato sauce. I just dump it on top of the rolls and the simmering action helps the shreds work their way down through. We serve them with mashed potatoes. Don’t boil too hard or they’ll unwrap themselves. Fabulous on a cold day! I make a huge batch in the fall and freeze multiple containers to pull out throughout the winter. This look great, very similar to what my Polish grandmother made, but a lot healthier. She used pork, beef, and veal for the meat mixture. She also used bacon in the bottom of the pan. I’ll have to try this recipe – thanks for sharing!! I so love cabbage roles. Aren’t they called “Gwumpkies”? Okay – don’t laugh …the spelling is prob. WAY off.. but they are great! My ex-mother in law made,what I thought, were the best. I think I still have the recipe but since then, I’ve gone vegetarian so when I attempt YOUR recipe (or rather your Mother in law’s), I’ll have to sub. with a vegetarian “beef” substitute. They look delish! I wait with bated breath for every recipe from you, Deb. So I was especially pleased and surprised to see this recipe. My German mother who would have been 100 a couple of Fridays ago made something very similar and called it “Halluption”. Not an appealing-sounding name for such good food. This is one of the recipes that I didn’t inherit, so I’ll give yours a try, and probably add sauerkraut. I could make my own sauerkraut with the “schliessl” (?) I did inherit, along with crocks and cabbage stomper. Cabbage being out of season, however . . .
OK, that sounds awesome, and like something which could make use of all these strange European veggies we get (like parsnips and savoy cabbage). Thanks! Carnies! I can’t say cabbage without quoting that line! There must be a million different recipes for cabbage rolls, but all of the ones that I’ve tried have been wonderful. In my family, we layer the rolls in the pot with bacon or slices of pan fried pork and sauerkraut along with tomato juice. Great eating on a cold winter day. Deb, your recipe looks fabulous and I will give it a whirl next time I make cabbage rolls. The veggies look great. Our family makes stuffed cabbage “Jewish Style”…the family was from Poland and Russia. Always ground beef, raw rice…the inside very similar to yours except no vegetables in it except onions…and then the tomato sauce has some brown sugar and lemon juice to make it sweet and sour and some raisins thrown in….delicious! Oh, dear Deb! This is such a great topic! Stuffed cabbage that connects all these European nations! (well, I didn’t know about Egyptian stuffed cabbage). This is the way MY Hungarian mother makes it: she uses a whole head of sour cabbage (that was pickled with the regular sauerkraut) to wrap the filling. The meat is pork (talking about sacrilege, spec. for Jewish people), mixed with rice, salt pepper and paprika. In a BIG pot she makes layers of sauerkraut, stuffed cab., some smoked pork (ham hocks or sausages or both!!) sauerkraut, stuffed cab, and some more kraut on top,+ few bay leaves, some extra peppercorns, water and she cooks it VERY slowly for many hours.Serves it with sour cream.Tasted even better the next day. It is a typical dish when a pig gets slaughtered and also at Christmastime OR anytime throughout the year. One thing is sure: my mom never EVER uses VEGETA. That is a commercial spice mix also available in Hungary but one of the ingredients is MSG. Tip: To test uncooked beef/pork/chicken filling, I always fry up a little spoonful in a small pan before stuffing. Works for cabbage, dumplings etc. That way I assure that I always get the seasoning right. Thanks for the recipe. I have a large cabbage in the freezer waiting to be made into golompki, It takes a few days for the cabbage to freeze through. Takes overnight to defrost. The leaves becomes very limp and make rolling a breeze. My secret is using alot of fried onions and lots of ground pepper, but no vegtables. I found that tomato soup makes a nice smooth sauce but tomato juice separates and is more watery. I add extra water to my soup sauce and bake it in the oven for at least 2 hrs. starting the job at 350 then reducing to 325 and then 300F. The sauce will almost disappear during the bake. Wow! I love stuffed cabbage and I am Chinese. My mother used to make them and they were stuffed with pork, a bit of dried shitake, onion. Hers were a bit on the sweet and sour side, using ketchup I think as a base, but always delicious. I think she had them at some Jewish deli in Los Angeles and created her own version (she tried burritos Chinese style with less success). I have always dreamed of making them but have not had a chance. All the comments are wonderful and I’m completely inspired. Thanks to everyone for the many variations. My Mum used to make something very similar to these too and I wonder where she learnt because her family is Scottish! I love all kinds of stuffed cabbage rolls, these ones, middle eastern style ones and a local vietnamese restaurant does a fantastic version with a plum sauce instead of tomato. All so good! My boyfriend loooves stuffed cabbage, but he is restricted from eating meat for medical reasons. Any suggestions for a different filling for stuffed cabbage, but one that still works? You can make meatless cabbage rolls. You just need alot of fried onions to give that wonderful flavour. You mix the onions with cooked rice, of your choice, salt & pepper. You can also use buckwheat which is very healthy. Finish baking the same way you would if using meat. About how many rolls does this typically make? I’m trying to calculate how many weight watchers points it would be :-) Looks delicious and healthy! This looks very similar to my grandmother’s recipe! Yum! Many happy memories. If you want even MORE flavor, tuck some slices of kielbasa in between the rolls. Hi Katie — I made (quickly inventories photo of whole pot) 10 or 11. They had about 1/3 cup filling in each. Deb – These look amazing! My mom makes a dish very similar to these. They are so yummy. As usual, I love your recipes, Deb! I get hungry just looking at and reading your blog-always a pleasure during my day to catch up on your new posts. Anyway, my mother-in-law essentially makes the same dish but it is “reconstructed” (perhaps “exploded”?!) like Katya’s (#51) and she also adds a sweet and sour twist to it with brown sugar and lemon juice. She uses beef (ground sirloin) most of the time, but has made it with fresh ground lamb. My grandmother used to make the stuffed version, also with a sweet and sour touch. My family and that of my husband have grandparents that are from Ukraine as well as Jewish, I have always thought that is why sweet and sour notes appear in so many of our family dishes. And I just want to add that I love cabbage in any form: stir-fried, steamed, baked, stuffed, in soup, or raw. I’m curious what you think of Veselka’s pierogis … I went there for the first time this past summer and was surprised at how bad they are. Maybe it was just an off night. Deb, I’m starting to think we’re related. This looks incredibly similar to my Zaide’s stuffed cabbage…though, I don’t have the recipe in front of me (Kosher dairy kitchen…no point in having meat recipes around), so I’m not positive. We make it once a year on Rosh Hashanah. We also have the same honey cake and apple cake – though, I think one of those might’ve been an old recipe from the NYTimes. oh I have a very soft spot for stuffed cabbage. thanks for praising a seriously underrated dish! These look delicious! I love cabbage, so I’ll be trying these. Incidentally, I still write in a planner…I’m from the Stone Age apparently! My family makes these… we are Hungarian and we call them “halupki” or “haloopkey”. It’s interesting to see how common they are. 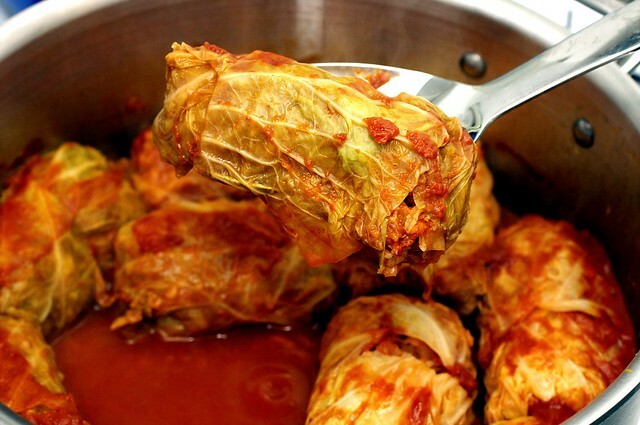 Stuffed cabbage is one of my favorite meals of all time, thank you for posting! looks beautiful. very appropriate for the recession budget. My friend put ginger snaps in hers which was curious. cinnamon with a tinge of added sugar. YUM! Another variation for this food: use brined cabbage (like Sauerkraut, but whole leaves), add also marjoram and thyme in stuffing and between rolls, and for a smoked taste spread some large pieces of smoked meat between rolls. I love it when you post these wonderful recipes that are gluten-free by default! No tweaking, no substituting — just ready to go. This looks wonderful. Can’t wait to try it. Thank you, I appreciate it! Deb – I just made these last week and I also use my mother-in-law’s recipe. The one piece of advice I can give you is that you should put the whole cabbage in the freezer for a day or two and then take it out and leave it in a huge bowl to defrost. The leaves are so soft and easy to work with. Then you dry each one carefully before stuffing and rolling. My tomato sauce has some sauteed onions, lemon juice and brown sugar in it and it makes a really delicious sauce. Try freezing the cabbage – you’ll thank me. Yum! I’ve never had cabbage rolls but I just happen to have a cabbage in the fridge. I bought it with the intention of picking up a corned beef but forgot. I was just wondering when I would have time to get back to the store when I saw your new post! We will be having this for supper tonight. I love reading all the comments about the different European cultures and their versions of this dish. The only dish I ever had cabbage in while growing up was cole slaw (I grew up in Alabama). As an adult I have learned to make a fabulous corned beef & cabbage dish. I’m excited to have a new page added to my recipe collection! I love these and once you get the hang of rolling and tucking they’re so easy (and cheap!) to make. I know them as holubky or golabki, which I believe means “little doves” in Slovak–because of the size & shape. We make them without the carrot, celery & parsnip, and with the sauerkraut and sometimes some kolbas in the sauce though. I always add some garlic and Hungarian paprika to the meat as well. I’m making these tonight, because I have a pound of ground elk that needs to be used ASAP. Ground elk: how’s that for sacrilege? One thing you can do to test the flavoring of the beef is to take a walnut sized piece of the mix and put it in the microwave for a minute until cooked through. The texture will be different then in the cooked dish of course but the flavor should be a very reasonable approximation. I do it all the time to test meatballs. Carnies! Circus folk… nomads, you know… LOVE THAT. My mom makes cabbage rolls but uses beef broth as a base and adds cinnamon to the ground beef mixture–more lebanese style. both versions are great. I’ve been making what I call cabbage roll soup lately. Tastes just like cabbage rolls, but without the time commitment! My grandmother used to make these and always called them “pigs in a blanket”, they were so delicious! Another old friend calls them “halupsi”. Thanks for the memories AND the recipe! Wonderful to see all the variations on a theme. My Mother was born in Russia (Siberia), and I use ketchup for the sauce. I saw Martha Stewart’s Polish mother using Campbell’s Tomato Soup. I also used pre-cooked rice, Uncle Ben’s. It needs to be pointed out — this is one of those recipes where an extra set of hands is a big help. It is time consuming. NOT eight hours like one of your readers spends. That post says she makes them the size of a pinkie finger. Mine were the size of a small burrito, and I roll them exactly like a burrito. Also, NEVER eat raw ground beef to check for seasoning. NEVER NEVER EVER. Just pinch off a small piece and fry, then taste. Please. I also wanted to recommend a recipe for escarole, since it’s your new favorite. Google “Braised escarole with garlic and lemon”. It was a Tyler Florence recipe on Food Network. I skip the garlic and red pepper but try it, you’ll like it. I learned this trick … core cabbage then place in freezer bag and freeze till frozen (overnight). Take out and let thaw for a non-cooked wilt for rolling. You will still have to slice off hard stem in middle of leaf but it works. It’s a tossup whether the Polish or Ukrainian influence is stronger here but whichever it is, halupchis, halubkis, etc, etc are on the menu for almost every civic feast. Usually with at least 20 different recipes – each touted as the world’s best. After all what monster is willing to admit that anyone has better recipes than his or her grandmother. One of my fondest memories is of a end of term party at the Sokol Hall (Polish organization) catered by the ladies group there – cheese, bread, sausage, kielbossa, a hundred varieties of pickles, halupchi, pirogies, all the beer you could drink over a period of six hours. Wow. One of the bar snacks at the Hall was a “Polish chicken sandwich” – fried kielbossa with raw onion on black bread. I’ve actually never been tempted by stuffed cabbage before, but these look lovely! I recently made homemade pierogies… these would make a great addition to my Polish cooking repertoire. Thanks! awesome. i’ve been trying to recreate my grandma’s recipe for years. hopefully this one is close! I am surprised to see so many suggestions (well over a dozen now!) that one freeze the cabbage first, for either a day or overnight. I always err on the side of what is faster and easier, and steeping it for 10 minutes certainly seemed like it is. Perhaps someone could clarify the benefit of the other method. Hi Deb. When vegetables are frozen, the ice crystals which form puncture the cell walls and this make them very floppy when they are later defrosted. Same reason why frozen berries end up in a puddle of juice and retain no texture upon defrosting. I haven’t the patience to read through all your commenters cause there are soooo many and all terrific comments…this has probably been said but in our house these are known as Holishkas (?) and I had lost the exact recipe from my mother-in-law who is a polish Jewish lady- so a great thanks cause now I know what I am going to make for Sunday dinner this weekend. She has been known to chop up any remaining cabbage and spread them out to cook too, so there is no waste; BUT make sure you use the Beano first!!! I was told by MIL that freezing works just finel, but there is a slight textural difference in the cabbage. Her personal preference was to simmer the head, so that’s what I do. Never tried freezing, so I can’t say. I think I have to make some of these in the next week. They’re such a great winter food. I make mine with ground turkey – talk about sacrilege! – onions, salt and pepper. My grandma used mostly pork in her meat mixture but also left out the rice. I’ll have to try them with savoy cabbage. I always use green. I know them as golabki (pronounced “gowombkey”). Cat, you probably know them as pigeons since golabki is the word for pigeons, diminutive. re: Veselka, I think their Polish food is so-so. The stuffed cabbage is too mushy and has too much rice. For the price, the pierogi are mediocre… too dough-y, imo. DCA If I have extra filling I usually make small meatballs and tuck them in amongst the rolls to cook. Just as tasty, and they will appeal to the fussier eaters that don’t like cabbage. The filling does freeze well if you make them regularly (and remember to get it out to thaw) It seems to be a take on the lazy version above. Haha, I love that you said this, because I majorly cringed when my Mom was teaching me how to make golabki two years ago and she told me the only way to test the seasoning in the raw beef/pork mixture was to taste it. I’ve only made the recipe once since and I just couldn’t bring myself to test the raw meat. Maybe one day! Deb, thanks for the recipe; it’s still winter-food season here, and believe it or not I’ve had stuffed cabbage on my mind, even though I haven’t had them in decades because my Polish step-grandmother Frieda died. She served them as one of about a dozen courses on Passover and Rosh Hashanah. Hers were a little sweet, so if I do get to invest the time in these I’ll try a little brown sugar. I always assumed it was a Polish recipe, but it sounds like it got scattered around the region. Dear Deb – I love your blog and get raves from guests on your recipes. In your head notes you mentioned that you forgot to dry the cabbage leaves, but I did not see any mention of how to dry them in the recipe itself, other than draining the cabbage head. Is that all that is needed. Great winter comfort food recipe! That looks absolutely delish. We have a lot of ground beef from our grocery shopping yesterday — this will definitely be one of the things I’ll be making from it! Thanks! What kind of bread would you recommend with this dish? Linda — I mention in the recipe that right before you roll them, you should pat them dry with a towel. Sheryl — Bread? I’m not sure I’d eat bread with a dish with rice. But, if you’re going for Russian Traditional, black bread is always welcome. My favorite favorite favorite recipe is over here. I seriously think that anyone with an even slight interest in black bread should make it — it is perfection. Deb – have you checked out Kachka in Portland? They have the most amazing Zakuski. Their cookbook is coming out later this year. Hi all – just a very quick comment. There are a couple of posts about recipes that include ginger snap crumbs. Oddly enough, I went to a chef demo this past weekend at Chicago’s green market and the chef, Hans Letz, I believe was his name, from the Intercontinental in Chicago, did a demo of german sauerbrauten. His recipe also included ginger snap crumbs. He said that it was traditional – that sauerbrauten was usually made around the Christmas holidays and that every house would have ginger snaps or ginger bread, and you would use it up by putting it in recipes. So that could be the origin of the ginger snap crumbs in these recipes as well. Oh, I’m hungry just looking at your beautiful pictures! I love stuffed cabbage and have made them a few times (being from Polish decent), but it takes so long! My MIL makes an unstuffed cabbage which is basically delicious meatballs, sauce and chopped cabbage. Her sauce is a mixture of tomato sauce, vinegar and sugar. I can’t seem to get the proportions of the sauce right and she just does it by taste (like many MIL’s do). Do you think yours would be good “unstuffed” dropping the meatballs into the sauce to cook and just cutting up the cabbage? My mom makes rolled cabbage every year for Rosh Hashana. Like other commenters, she just uses beef (or ground turkey) and rice for the filling, and the sauce is a sweet and sour one. She freezes the leftovers in individual Ziploc containers and wraps them in foil. Just let them defrost and heat up and they are great. Oh, girl… this is getting made pronto. I’ve always wanted to make stuffed cabbage, but I needed a mom/grandma endorsement. Alex’s mom will do just fine. YES. I’m super excited. Ooh, fun–something else to do with the parsnips in the garden! They’re almost ready, too. I have been meaning to try Neptune. There is this great place in greenpoint that I love for polish food. I want to try making my own stuffed cabbage so thanks for the recipe. Ohh I am so glad I found your blog and this recipe for halupchis (my mother’s family is from the Ukraine and I grew up going to a Ukrainian church..that is how they pronounce them). She always tries to tell me how to make them…because she knows how to make them without a recipe and can’t give me a good recipe. SO…THANK YOU!!! I am going to make this recipe and freeze them and send them to her to taste! Of course, regardless how good they are..they’ll never be as good as her’s or my grandmothers! I just made these on saturday…and failed miserably. BUT, this definitely gave me some technique ideas. Thanks! My recipe is a Bulgarian version, but it’s very, very similar. My goodness, Deb – my mom used to cook these! She loved them, and so did my father. When I was single, I used to make these sometimes for him, for good old day’s sake. Thank you for the lovely trip down memory lane, darling. It was a success! I posted a comment yesterday that I was going to attempt these last night. I did and they were so YUMMY! Now I definetly am going to practice this dish a few more times before I make them for anyone else. I live in CT and there are a lot of people here of European decent. I am sure I would give someone a heart attack to see how poorly I wrapped my cabbage rolls! So even though mine were not nearly as pretty as yours – the taste was FANTASTIC! My husband and kids practically licked their plates clean (after filling them 2 or 3 times)! I did not have the type of cabbage you recommended and I found that the leaves were too stiff to work with after soaking the head in the boiling water. So I just put some plastic wrap over the bowl and them microwaved it for a few minutes – worked like a champ. THANKS! OH – I forgot to tell you that I also made your chocolate chip cookie recipe as an after-school snack for my sons and their friends. They are awesome! They are the most chocolatiest ones I’ve ever had! My mother in-law occasionally makes her golubsy (can’t spell that word properly in English, unfortunately) as (again, can’t spell this properly) lenevia golubsy, or, ‘lazy golubsy’, which involves just shredding the cabbage instead of making little packages. Cuts prep time down by quite a bit, and leaves it tasting just as wonderful. Why, I have had a cabbage roll with beers, thank you :) Cabbage is excellent for drinking! There is some sort of enzyme that helps prevent hangovers in it. Love cabbage rolls – my past attempts have not gone well; might try this one. this inspired me to make cabbage (for the second time ever!) and i made cabbage and ground lamb for dinner last night. delicious. A question: Does the rice get cooked when the stuffed cabbages simmer in the tomato stock, or should it be cooked prior to adding it to the stuffing mixture? Many other recipes I’ve seen call for cooked rice. Thanks for another great recipe! It cooks on the stove, with the meat and everything else. See how easy this is? I’ve been avoiding making these so far (Ukrainian food-making is time-consuming! So far I’ve mastered varenyky, yum! But not much else). But it looks like I’ll have to try this recipe – it looks delicious! I love stuffed cabbage, being the Polish person that I am. My mom sometimes makes a stuffed cabbage casserole. You can cheat and buy a bag of cole slaw and basically layer the ingredients in a deep skillet, cover and simmer. Deb – just to clarify why freezing the cabbage is easier. Even when soaking the cabbage in water, when you try and remove the leaves, they often tear. They’re still stiff and when the cabbage leaves are kind of folded into each other, it makes them hard to remove carefully. Freezing then defrosting them makes the leaves simply fall apart, leaving whole, perfect and untorn leaves to work with. Also the center rib is as soft as it can be and it makes them a cinch to roll up. Deb – this is the first time I’m leaving a comment here…. have been a fan of your website for a while now and I had to leave a comment after I saw that. It instantly took me home to Poland:) My mum and nana make the best golabki in the world (i guess you can translate golabki as ‘little pigeons’ – no idea why, I remember when I was a kid I used to think they are made out of pigeons… haha) – I was always scared to make them but I guess I should try… Ohhhh, it’s 12 am now and I’m drooling… the taste of golabki with boiled new potatoes and tomato sauce…aaaahhhhh…. The leftovers are now in the freezer. We loved! this dish and it has been added to the list*. I had a problem soaking the cabbage as you suggested – the hot water did not seep throughout the head, so I eventually removed all the leaves and boiled them for 5 minutes (lots of tearing). Next time I’ll boil either boil it or try the microwave method Joanna used – my freezer is way too small to try putting a cabbage in there. I look forward to the next time I make this, when hopefully, the rolls will look as good as the dish tastes! * – Acceptable recipes for frequent rotation. Made this recipe tonight. Was delicious. Planned to freeze the second batch (didn’t have a big enough pan for them all), but everybody wanted seconds! I get the quote . . . it’s from Something About Mary. My favorite Polish restaurant with knock-out stuffed cabbage (we pronounce it something like “gwompke”) is in the Greenpoint neighborhood in Brooklyn, called Kings Feast on Manhattan Avenue (there is a life size knight in armor outside!). It trumps Veselka without a doubt! And, the Kings Feast has a “Polish Plate” entre option that comes with three pierogi’s, two gwompkes, two large and lovely potato pancakes, and a small hunk of kielbasa. Before your meal they bring you warm pickled beets and onion coleslaw. All for $8! I grew up on Polish food, and this place is really good and homey (and you can not beat the price, either). I couldn’t read all the comments but a short video demonstrating how to roll up the cabbage rolls would be helpful to most people. Me? It’s in my genes … czech out the name. May (poster#1), thanks for the great tip! Makes me say duh! Why didn’t I ever think of that? Deb, thanks for the recipe. It’s a great time of year for stuffed cabbage. St. Patty’s isn’t too far off.. I made this tonight and it was delicious! I wasn’t expecting it to be because I had a really hard time rolling my leaves. They weren’t the prettiest, but they sure were tasty. I used a pork/beef combo. Thanks for the recipe! I made this a couple of nights ago and it turned out great. My husband wasn’t excited about it but he loved it! Thanks for the great recipe. This is a wonderful comfort food recipe. My mom would use the tomato soup instead of tomato sauce and after putting the stuffed cabages in pot would top it with a can or two of drained sauerkraut–delicious! I’m not sure where this sauerkraut addition originated though. My mother was of irish and english decent. It’s the way her mom made it and now I make it this way too. We never used carrots, parsips or celery in it but we do add the minced garlic and a little chopped onion. Oh, I love stuffed cabbage! I usually make dolmathes but when I don’t have vine leaves, this is the next best thing! Excellent recipe! I added some caraway seeds to both the filling and the sauce for a bit more Eastern European flavor… some quality sauerkraut (as mentioned above) would also be a good idea. I tried this recipe on Monday and froze the leftovers. Had some leftovers tonight! Delicious. Thanks for sharing! This didn’t work for me. After 40 minutes the cabbage was soggy and burnt and the brown rice never cooked through. Prep was east enough but parsnip dominated and meat underseasoned. Thankfully I also made the gingersnsp & chocolate thing wow!! Rocked my world. Brown rice takes longer to cook. Also, if the cabbage burnt, there may not have been enough liquid in the pot. It should cover the cabbage rolls. Simmering on low in a covered pot for 45 minutes should not burn it with adequate liquid. I also err on the side of faster and easier (#107), which is why I don’t stuff the cabbage at all. I cut it into 1/2″ strips and put it on the bottom of the pan. Make the filling as usual and form it into egg shaped and sized “balls”. Lay those on top of the cabbage, pour the tomato/liquid over and cook as directed. Presentation isn’t quite the same, but the taste is and it’s easier and faster to prepare. I’m so lazy. I make the meat filling using lamb, onion, garlic, and middle eastern spices. Layer Savory Cabbage and the filling until baking dish is full. Top with Tomato Soup and bake until cabbage is done. Serve with rice that I cooked in my NEW Zojirushi Fuzzy Logic Rice Cooker (such a neat new appliance). Oh, I saute the meat filling before layering, so I can drain the grease from the meat. Great blog. My mother’s recipe added 1/4c brown sugar and two lemons, sliced very thin, to the sauce. The lemons were layered with the cabbage rolls. This gives a lovely sweet and sour flavor- very Eastern European Jewish. I make it the same way, usually with beef, sometimes with turkey, and sometimes with a vegetarian filling- rice and cracked wheat, rice and beans, etc. Great recipe! The wife and I are looking forward to trying it. One question: at the end of the post you mention the they freeze well. Is this cooked or uncooked? I’m so excited this is my first post on ANY blog! Reading all of your comments and ideas made me crazy to make these. I froze the cabbage 3 days. Great idea! It took 2 days to thaw. The cabbage was soft and easy to roll and fill. I used an ice cream scoop for even size and the rolling directions I read,(roll once fold in 1 end finish rolling and tuck in other end with finger) worked perfectly. I made 2 fillings. Beef, pork, onion, carrots and rutabaga ( I forgot parsnips, Oh well) precooked seasoned brown rice. Awesome. I made two pans of these, one with just tomato sauce the other also had sour kraut and bacon. The second was Asian style. Pork, beef, onion, green onion, red pepper with soy sauce, sesame oil, garlic and ginger. These were simmered in an Asian style soup broth. They were a knock out with hoisin sauce on the side. Thanks for the inspiration everyone! I always make Golubtzy for Rosh ha Shana. I toss a bunch of raisins in the sause and a spoon of plum/prune preserves and brown sugar to give it a touch of sweetness. In Russia we used to roll stuffed cabbage, then fried them briefly on both sides till the cabbage leaves browned and then put them in the sause. OK, two months later, but I just ran across this. My mother also made great cabbage rolls, so I had to comment. I’d have to look at her recipe again, which she hand wrote for me before she passed away, thank goodness, but it is pretty similar to this. I do know she added a boneless pork rib to the pot to add flavor to the sauce. Thanks for the memories. I made these tonight, with….wait for it… soy crumbles instead of meat protein. And you know what? Amazing. I’m sure it’ s a “sacrilege” of some sort make these vegetarian (or even, really, vegan) but wow. Fantastic and very much like I remember my friend’s mother making them. I paired them with your quick pierogies and this was a meal fit for a queen. So good. So, so good. Thank you. I tried to make these vegetarian with firm tofu rather than beef. Final outcome: disappointing. In one batch I added in some feta which helped, but the overall lack of rich flavor still made them mediocre. However, I had left over mix which I simply didn’t have room to stuff into cabbage in the pan, and the next day I broke in an egg and fried the “batter” up like latkes. Topped with plain Greek yogurt (substitution for sour cream), they were yummy! I may attempt the stuffed cabbage recipe again, this time using a soy protein with a flavor closer to meat or maybe with eggs. But then again, considering the effort and my previous result, I may not. I just made this last night for my husband and our 4 sometimes picky boys. OMG they were amazing!!! We are now going to include these on our favorite meals list…yeah something new to do w/ ground turkey!!! Oh I should say that I used ground turkey because we try to eat healthy and I added 2 garlic cloves (minced) to the meat mixture. I also used my homemade spaghetti sauce and then we sprinkled parm cheese on top. UMM UMM!!! Thank you! I’ve only recently discovered your site – and I’m completely addicted. Thank you! Have you ever stuffed a whole cabbage? I’m planning to try it this weekend, but every recipe I’ve seen leaves the tough bottom on. I know cooking with soften it, but I’m curious if you’ve ever tried cutting core from the bottom. I’m not sure if the leaves will fall apart without the thick bottom. If you’ve never tried, I’ll let you know if I end up with fallen cabbage layers instead of stuffed whole cabbage :-) Keep up the great work – you’re a great inspiration for us cooks-in-small-spaces. I just made this using Kangaroo mince and a little sausage mince, added some chilli flakes(goes great with kangaroo!) with a tomato and eggplant passata sauce and cooked it on low in the slow cooker which I lined with cabbage leaves first. Can you say, delicious? I just had to say that these are very similar to my grandma’s rolls (Polish). I decided to try your recipe, however, because hers does not have carrot and celery. And I’ll do just about anything to get some extra veggies into the kids. Jewish/ Hungarian verson: Add saurkraut and brown sugar to taste before baking. I just use ground beef, eggs and rice for the filling. If you are worried about the rice being fully cooked, use instant. People love, love, love this dish! My mom is full blooded Italian and she made these without the veggies and rice. She says rice is just filler. She called them pigs in a blanket. If you want the real deal, mix together the ground beef, garlic, onion, breadcrumbs, one egg and some straight tomato sauce. Then stuff your leaves with that. You can even add some ricotta cheese to the meat mixture. I like to mix egg, ricotta, and garlic and let set overnight. Then mix it up with the rest of the stuff before stuffing. Mom also added more juice to the pot and threw in quartered potatoes so you just scoop and eat. OMG!!!! I’m going to make some right now!!!! Deb I just made this tonight and OMG it was good. Different recipe from the last one I used and it was unbelievably delicious. I once had it at a friends and they got the bottom layer all crispy and I’m wondering if you have a suggestion as to how to get it like that. Will cooking it in the oven make the bottom layer crispy? tried the recipe and it was an absolute hit! would you suggest freezing after they’re cooked or before? you should try to put cut cellophane noodles it this recipe too…. I use leftover mandoo* stuffing, and put it in the cabbage. grace, do you have a good mandoo filling recipe you could share? I have made these several times now. They come out just perfect EVERY time. These are now a part of regular menu at home. I love love love them. I could eat them everyday. My mom used to make us this dish and stuffed grape leaves all the time. Now, these are emotional foods for me and my favorite foods. Cat said that her Polish/Lithuanian family called stufed cabbage rolls “stuffed pigeons”. That’s probably because in Ukrainian “holubtsi” are “pigeons”. The recipe sounds lots like my mom’s with some differences. She would always pre-cook the rice about half done. Also she often used pork instead of beef. Mmm, comfort food. I followed this recipe exactly after several mishaps with other more elaborate stuffed cabbage recipes; my search ends here. This was the flavor I was looking for all along. Thank you and thank you to Alex’s mom for sharing. My grandmother’s trick is to put sliced apple at the bottom of the pot when cooking the stuffed cabbage. I can’t remember what kind, I’m guessing something tart or sour like McIntosh or Granny Smith so it gives the stuffed cabbage a tart sweetness, but the next time you make stuffed cabbage it might be worth your while to try :) . I made this exactly as written, and it was delicious. And surprisingly quick to make on a weeknight – the stuffing didn’t take nearly as long as I’d feared once I got the hang of it. It made 16 rolls – my five year old ate FOUR of them! Mine burned a little, which I didn’t realize until I took them out of the pot, so next time I need to watch the heat a little more. But other than that – perfection! I especially loved the extra veggies in the stuffing, which added so much yumminess to the normal beef and rice mix I’ve had in stuffed cabbage. My grandma used to make us halupkis when I was little. My mom has Alzheimer’s disease and I’ve been trying to recreate my grandma’s old recipes to see if they might spark some memories. Halupkis were one of her favorite dishes but I’ve never been able to figure out how to make it. Your recipe looks like a very similar version so i’ll be trying it next weekend. The only thing I remember my grandma doing differently from yours is that she added the leftover cabbage, chopped, on top and there were always pieces of kielbasa cooking in the pot along with the stuffed cabbages. excuse the questionmarks, silly wrote it in Greek! OMG – these are so good. My husband is 50% Polish so I’ve been looking for a good Golumpki recipe for years. I made these last week and they were a big hit,even with my kids ages 8 to 16, and not very hard to make. I’m making them again tonight (they’re simmering on the stove as I type). I made a couple of minor tweaks though. The rice was a little on the crunchy side so this time I added a little water to the meat/rice mixture. Also, the cabbage did not blanch all the way through, making the inner layers difficult to peel off. I just kept the water simmering and dunked it as I needed to get all the layers off. Thanks for a great recipe! Great tip on how to soften the cabbage leaves! Many thanks! I have been making stuffed cabbage for years and just want to add a few tweaks. I mix rice, ch. onion, egg, bread crumbs, ch. garlic and grated apple to my meatball mixture. I found that reg. ground beef not lowfat seems to work better. I use tomato soup and some bouillon as a base for a sweet and sour sauce and the best trick I learned from a restaurant chef was to wring the cabbage rolls in a damp cloth or cheesecloth. It hold them together tightly throughout the whole cooking process. The recipe came from a neighbor born in Poland and I love these with creamy mashed potatoes. Just discovered your website recently and love it! Everything I’ve cooked from it so far has been fantastic. Quick question on this – I’m a vegetarian – what do you think might be good substitutes for the ground beef? Two cups of lentils? Chopped mushrooms? The recipe sounds great and I would love to try it. Any ideas would be appreciated! Lentils and mushrooms would be great. Might only need a cup or so. Good recipe, delicious. I ended up swapping out the carrot and parsnip for beets for a nice deep red color and taste, thought it would be fun since tomorrow is Valentine’s day. The rice didn’t quite cook throughout int he 45 mins so I kept them simmering for another 20 mins. I only discovered your blog today and I am loving it. Ive spent the last three hours on it and can’t get enough! Will definately be coming back for more and the recipe Ive picked today is the NY rye bread. In Poland rye bread is very popular and here in Ireland you can only buy it in organic/health shops. Ive been trying to make my own but most of the recipes require the starter which never comes out right for me. So fingers crossed your recipe will work this time. Do you mean they freezer well when they are completely made or do you just freeze the filling? How long do they keep in the freezer and how do you recommend defrosting/heating them up again? Angi — You can freeze the cooked dish. Or the filling. It’s up to you. No idea how long it keeps in the freezer, I’ve never checked. This is something my grandma makes every time we go to visit and I think they are one of my FAVORITE meals. This recipe seriously sounds just like hers. Is your husband German? She does that and a bunch of other German dishes, I was wondering yesterday if you had every had Cabbage Soup and here you are talking about it! Also a favorite :D There’s also this Cottage cheese pocket thing she would make with onion covered with gravy served with some type of sausage. IDK, childhood memories surfacing :D I never knew her secrets (like lightly cooking the cabbage and taking out the vein things before wrapping them). Thanks for sharing! My daughter altered my recipe by adding italian seasoned bread crumbs as well as instant rice. Natures season and rotel chopped tomatoes and chiles add flavor to the ground beef.we use dried minced onions and precook the cabbage whole and peel it. I tried to cut core and do leaves separate and it was too done. Try v8 juice or tomatoes in juice,blended. it is ok to experiment! Thank you for this! I love your blog and was looking for something to make for my husband who has been sick all week. He just happens to be Ukrainian and named Alex. When I showed him the recipe his face lit up. “My mom does that too!” he said of various steps. I can never make anything Ukrainian as good as his mom can, according to him, but I’m hoping this will come close. Sounds delicious. I’ve been trying to find a good recipe for stuffed cabbage, or sarmale, the romanian name for this dish, which my bf loves oh so much. So, it’s not necessary to cook the beef before putting in pot? The beef and rice all cook together in the pot. Thanks so much for the recipe. We made this last night with a few variations necessitated by our pantry situation (it was delish). If anybody wants to mix it up, go ahead and substitute kasha (buckwheat) for the rice and zucchini (grilled and chopped) for the parsnip. We also threw some chopped scallion and cilantro into the mix. You can reheat it in a pan (I’d add extra sauce or water to loosen up the sauce) or in a low oven in a covered dish. than stuffed cabbage rolls. I have tried them all, but I’m sure there are more. Just made a 5 pound batch for a party using ground turkey and just plain tomato soup with a little ketchup mixed in. Everyone raved about them and wanted the recipe. The hardest part is waiting for them to finish cooking, the aroma just fills the house. I made these for Rosh Hashana last night and everything was great EXCEPT my rice never cooked. Next time I will put already cooked rice. My dear guests never said a thing so I’m blessed for another sweet year! I don’t have any parsnips on hand. Is there anything that could be substituted? Could I leave it out? You could use extra carrot. Awesome! I actually used a little more carrot. Sweetened it a bit. My grandma used to make stuffed cabbage (and freeze them) all the time! She has Alzheimer’s now, and can’t cook anymore. This recipe is almost identical to her’s and I love that I have one to follow now instead of trying from memory. Thanks again, Deb! I’ll have to give this a try. Last year I went with my husband to Babcia’s house so she could teach us to make her golumpki, and learned that they taste so good because she uses a metric ton of butter, cream, “Vegeta” seasoning, and bacon fat. We also witnessed her tasting hunks of the raw beef/pork mixture for seasoning several times over the course of the afternoon. Ahhhhhhh! I was not expecting Fun With Trichinosis, although it was fun to spend time with her in the kitchen. But yes, these look very tasty and way less artery-busting, so I’ll have to give them a go. Grew up in Northern Alberta, Canada where there is a large Ukrainian population ….. no holiday or wedding was complete without cabbage rolls and perogi. These are perfectly satisfying my craving for cabbage rolls, thanks for a great recipe. Now, I also remember my German grandmothers cabbage rolls that were made with soured cabbage …. Looks great..but my (mothers/grandmothers) version has a sweet and sour sauce. Try adding equal amounts of sugar and vinegar to the sauce, and some raisins. It really adds another flavor dimension. I made this tonight and they were really good! I love trying new (to me) ethnic/peasant type foods. I made the recipe as followed, with 1 jar of 365 fat free pasta sauce and 1 can of Amy’s low sodium tomato soup (it was what I had on hand). I was able to make 15 small rolls with a fairly small head of cabbage. After reading the 1st commenter idea, I did a taste test of the meat mix by cooking some. I decided I needed a bit of a kick, so I added good sprinkle of coriander – came out great! I do that with any meat mixtures … meatloaf, meatballs, meat patties, etc. The hardest part is the actual rolling. Maybe next time it will be a bit easier. This recipe looks great. What is typically served with them to fill out the meal? Made these last night. They were delicious. Kids even ate them after complaining for the hour before dinner that they didn’t like cabbage. Looking forward to leftovers tonight! Followed the recipe with no substitutions. For me, the hot water bath on the cabbage softened the first 3-4 leaves I pulled off and the rest were too stiff to roll and I had to re-bathe them. Also, I used a 14-oz can of Muir Glen tomato sauce and a small can of Hunt’s tomato sauce because that’s what I had in the house and in the end there was a small amount of thickish sauce on the bottom of the pot. I would have liked more/thinner sauce so I would err on the side of 4 cups of tomato sauce – probably a combination of tomato sauce and juice. I made these last night to go with the Sharlotka. I come from plain American stock and I’d never had stuffed cabbage before. It’s probably sacrilege to the Russians, but I used a mix of ground chicken and ground chicken sausage in the filling instead of ground beef. I also used most of a large can of V8 to bathe the rolls. It was delicious. My husband and I enjoyed our first Russian food experience. Thanks, Deb! Jess — Love the sausage idea. I have to try that; I think my husband would love it. I noticed that you said you under seasoned your dish, but I was wondering what you seasoned it with…in the recipe, I only see tomato as a seasoning….did you use anything else? Kristyn — Salt and pepper. My MIL is generous with both. I will make sure the recipe clarifies this, sorry about that. We made this over the weekend and LOVED it! We included kielbasa, too, as stuffing instead of beef. We also started by cracking fennel seeds in oil before sauteing the vegetables and added heavy garlic. Brilliant. Easy. Delicious. Thank you! Deb, I’ve recently discovered your blog and like it very much. You have some wonderful recipes and a lovely conversational writing style. I was scanning the recipe archive and the stuffed cabbage caught my eye. I liked reading your MIL’s rendition and it made me think of the one my Jewish grandmother used to make (sweet and sour tomato sauce and raisins.) I also really enjoyed reading all the comments here. Clearly many people have grandmothers, mothers and aunts who make this traditonal dish and you gave them a place to remember and compare. I think I’ll be trying my grandmother’s and Alex’s mom’s versions this winter. Thanks for sharing with all of us. I don’t understand….These are called golabki (pronounced “gowombkey”) nothing else! You must put a small amount of choped cabbage in the mix and place the large outer leaves on the bottom of the pot for, one, flavor and, two, so to buffer the bottom “golabki” from sticking on during the long, slow. simmer. also add a pork chop on the bottom for more flavor. No carrots or parsnips but add whole chopped tomatoes and maybe some minced green peppers into the mix. Oh, and don’t ever leave out the garlic! I KNOW A MOM OF ALEX, SO I WILL SEND THE RECIPE TO HER. CALL IT A WHIM, BUT STUFFED CABBAGE SEEMED TO BE A GOOD IDEA FOR DINNER THIS EVENING. WHEN I CHECKED STUFFED CABBAGE—HERE WAS MY ANSWER–A DELICIOUS ONE. THANK YOU FOR THE EFFORT OF POSTING. I APPRECIATE IT…USED MY CARROTS IN CHICKEN SOUP FOR LUNCH, SO I DID GREEN PEPPER…THAT IS THE BEAUTY OF COOKING. IT IS CREATIVE–TAKING THE BASIC AND ADDING A UNIQUE TOUCH. ISN’T THAT THE SPICE OF LIFE??? ?…DON’T YOU JUST LOVE IT!!!!! Corn Bread is amazing with these cabbage rolls. While spending time in egypt i to was fortunate enought to be taught on how to cook these their way as well as grape leaves. They use lamb and or beef, usually lamb. Roll them and of course with allspice in mixture. Use broth or water with allspcie. Plate on top and let them boil them simmer until done. FANTASTIC and cheap. I forgot to add the egyptians i stayed with cooked their rolls in GHEE, can be purchased in mediterrean stores. SO good. you said you’d forgotten to dry out the cabbage- maybe i read it wrong, but when would you do that? after cutting the core, or after pouring the boiling water? In the last full paragraph, I suggest that you pat the leaves dry before using them. It works either way, but the final result will be less watery if you pat them dry. I am Russian and was very pleased to see that you recipe is clearly very authentic. So glad that good examples of Russian food are becoming known. Have you ever tried mixing beef and pork for the stuffing? I usually do 3 parts beef and 1 part pork. Also, I miss crushed tomatoes with sour cream for the sauce. The sour cream seems to soften the acidity of the tomatoes. I’m glad you’re still answering comments on this recipe! I want to make this next week, but I also want to make one of your slaws (I haven’t decided which yet…). Did you actually use the whole head of cabbage to make these? The head of cabbage I bought is pretty big (9 inches diameter)… do you think it’s big enough for these and a small batch of slaw? I can’t remember but I think this recipe makes 10 to 12 rolls. So, you’d definitely have cabbage leftover but it would be the smaller leaves (not that this matters for slaw). Happy slaw-ing! I was looking for a baked stuffed cabbage recipe to remind me of temperature and how long to leave them in the oven. When I saw smitten kitchen had a recipe, I didn’t go any further. Although I didn’t use your recipe this time, I wanted to pass along a couple tips from my mother from many years ago, when my cabbage rolls, although delicious, were hard as rocks!!!! Hmmmm…. I wonder if that’s why my son still calls them ‘grenades’? Anyway… she told me to mix the meat only enough to incorporate all the ingredients and roll the cabbage leaves loosely. Apparently, if uncooked rice doesn’t have sufficient room to expand, the cabbage rolls tend to be tough. BTW… I cut around the core then put the cabbage in hot-to-boiling water. With this method, I find that by NOT cutting out the core it can be a ‘handle’ to hold with tongs. The leaves fall off with very little coaxing once they’ve been completely cut from the core. Then I put the loosened leaves in the roasting pan I’m going to bake them in, lined with a single layer of paper towels to collect excess water. I don’t pat them dry… a little extra extra water won’t hurt anything or change the flavor. Thanks again for the zucchini bread recipe!!!! off to make some! yummy! OMG, I can’t believe you made this. It looks sooooo yummy! I didn’t know it’s popular in Russia too. I am Romanian and this is one of our traditional foods (although it appears it originates in Turkey, according to some). We cook it for Christmas and Easter, along with other goodies. I’ve been living here for 2 years and still havent found the courage to do it…. until running into your recipe. It’s 11 pm and im drooling so this has to be done :) We also use grape leaves instead of courage (i think this comes from the Greek dolmadas) and I actually like it more than the cabbage (which, by the way, in Romania is usually pickled. It just gives the roll a sour taste – love it!!!) So I got a friend here and she makes them in the crock pot. Takes longer but they taste amazing. Im gonna try your recipe and probably throw them in the crock pot. Thanks for the motivation :) I have to buy your book!! I was pressing the “Surprise!” button the other night and saw this, so it inspired me to make my family’s version (I do a couple times per year, anyway, and had a cabbage sitting in the fridge). I am from Slovakian descent and Slovaks call stuffed cabbage ‘halupki.’ Our recipe is almost the same, minus the vegetable addition, but over the years, I’d started adding more vegetables anyway. What I make looks just like your pictures above. (And I might have added your carrots if the grater hadn’t been dirty! ;D ). Next time. My grandmother used to make these. We pronounced them go-wump-keys, but my dad would always say, go-lump-keys. Interesting how food can bring back such fond memories. my Dad always added dill weed to the meat mixture and called it the secret ingredient. The other day, a friend who I frequently share my kitchen exploits with, mentioned Stuffed Cabbage. It was a not-so-subtle hint and I began as I always do when pondering something new and foreign to my kitchen: I Google it to death. Several hours and recipe perusals later, I just now did a quick visual of all the Google images. I went back and started with the very first image that appears when you google “Stuffed Cabbage”. I had to smile with I saw that it was Smitten Kitchen. After 2 years, I know I should know to come here first but my kitchen OCD compels me otherwise. Funny that the last commenter is Michele too. I was meant to make these Cabbage Rolls! We use about a cup of soaked basmati rice, a little minced meat, tomato cubes, finely chopped onions, dill leaves and fresh coriander. At the bottom of the pot we put the remaining cabbage leaves and the removed veins and we cook them either with tomato paste deluted in water, or in another variation with pomegranate molasses, and yet another variation is to cook it with deluted tamarind and about a quarter of a cup of sugar … yummy. 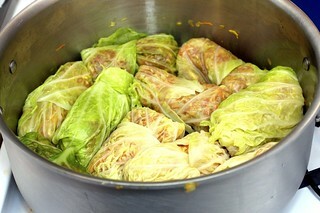 This summer, Mr. Ivriniel and I decided to make some cabbage rolls using a “sour head” cabbage. Sour head cabbage is like sauerkraut, only the cabbage head is left whole through the fermenting process. They turned out delicious. And the best bit? You don’t have to boil the cabbage leaves beforehand, because the fermenting process has already softened them. I use the regualr cabbage not the savoy type, and instead of covering it with water as suggested I just stick mine in the freezer overnight and then thaw it a little and its ready to stuff, and the leaves and just perfect. I do not eat beef so I use either groung turkey or chicken. I also cook my rice before time and then stuff the leaves. Another option is not using any meat and flavoring the rice with different herbs you have on hand, cilantro, parsley, green onions, you can use what ever flavors you think go together and its all good! they are really easier to roll and very tastey. Eating them now, and they’re so yum! I used quinoa instead of rice for that low-carb feel. Also, not having savoy cabbage, I had to simmer for about 90 minutes to get really tender cabbage (but in a dutch oven, the meat isn’t tough). Yummmmmmmy! 2. I have never commented before, but couldn’t help it on this one. I am Russian (born in the Ukraine) and my grandma makes the BEST Galuptsy, so I feel for you on “never having the need to make them myself”. I am quite embarassed that I have never made them. Also, curious, does Alex speak Russian/Ukrainian? Small hands, smell like cabbage! with divine inspiration from this ah mazing blog, i made a vegetarian version of this last night. the filling was 1 lb mushrooms (used shitakes and baby bellas) and 1 cup cooked french lentils. i made my own tomato sauce – sauted onions, carrots, garlic chili flakes and hand crushed tomatoes with some minced fresh herbs. to thin out the sauce and have it cover more of the cabbage packages, i used some chicken stock (homemade, of course). i was surprised at the hearty and delicious flavor from the simple filling. i think it helped that i sauted the mushrooms by themselves first, and then added them to the lentils. thanks for this recipe, deb! Haha, sarma rulz!Try adding tiny slices of bacon in filling and between rolls, or try putting them in the oven for last 20 minutes…and bread is there for dipping in that yummy sauce, of course. The technique of freezing the cabbage first is interesting, especially as this is a traditional peasant dish, dating from long before refrigeration. This suggests an intriguing origin and common-sense logic: What can you do with your cabbage if it has frozen in the cellar or in the field? Make cabbage rolls. Lots of them, or you’ll be wasting precious assets. Invite friends over if you need help eating them, or bring them to a party. I find it fascinating and instructive to deduce the origins of old recipes and techniques from the standpoint that tradition is born from necessity and practicality. This approach usually leads to authenticity, and enhances the pleasure of the cooking and eating. I made stuffed cabbage tonight. I did not use parsnips only because I forgot to buy them. I added garlic to the ground beef and they were great. I did however use your recipe for the most part. Thank you. It was the first time I have ever made them and it did take awhile but the wait was worth the time. I was in the mood to make stuffed cabbage for my family and came across this recipe. I, unfortunately, purchased the regular cabbage and had a hard time getting whole leaves peeled – even after after pouring boiling water over the cored cabbage and letting it sit. I was about to use the whole batch of ripped up cabbage for mulch. But, I just couldn’t waste that cabbage. So, I cut the torn leaves into half inch strips and put those in my sauce. I then shaped the meat mixture into meatballs (omitting the tomato paste and rice) and placed those in the sauce with the strips of cabbage. It came out great and my family enjoyed it – was like a stew. I know this is not traditional stuffed cabbage, but I just couldn’t waste that cabbage! I have made this recipe a few times, and it has always turned out great. I have been eating a lot of collards since the new year and it struck me to try this with collards instead of cabbage. They looked so beautiful in the pot before I covered them with sauce, reminded me of the leaves that wrapped the lembas bread in Lord of the Rings. They were delicious, in fact I will probably never go back to cabbage! I recently tried this, and it is now one of my favorite recipes. I especially love parsnips! Just made these for dinner and they were great and my family loved it too. I only had vodka parm sauce in the pantry and I just added a bit of water and it worked really well. Tell Alex I said hi. We worked together in his TMP days. My Polis mother made these with a can of tomato soup but I use tomatoe paste and diced tomatoes. It is almost a golumbki soup. Absolutely FABULOUS! We add onion, egg and bell pepper to the meat with a little rice. Reading this many moons later, and just have to say that I totally get the Joe Dirt reference, and I say it all the time when either 1) carnivals or 2) cabbage enters into any conversation. Excited to try both stuffed cabbage recipes! Gah, not Joe Dirt, Austin Powers. Same thing? My Russian mother made this, too. Loved it. She was a horrid cook — unless she was making Russian or Russian Jewish dishes. Those sang. I NEVER wrote them down. Some I come close in taste to her’s, some not so close. This recipe is very close to her recipe. She used regular cabbage and pre-cooked rice. And I’m pretty sure she used Ketchup. Heinz 57. Had to be Heinz. She used Ketchup in her spaghetti sauce, too. No long cooking — just browned some ground beef, added some canned mushrooms then ketchup. Viola. Spaghetti sauce. No salt, no pepper, no garlic or onions, no herbs, no long simmering. Now I think it’s funny. Then I ate it. Or else. Because there were all those starving children in China. Never heard about the starving adults, only the children. Am I the only adult who was admonished to clean her plate because other children, in other parts of the world didn’t have enough to eat? I’m always on a hunt for good stuffed cabbage recipe. will definitely try this one. you are soo funny Marie M.C. You are not the only one who were required to clean the plate. But my mom was always mentioning all the starving children in Africa…. I was going to try your latest cabbage roll version, but I have this sweet sour version stuck in my head so I riffed on this one. I just used this recipe to make my own first ever stuffed cabbage, absolutely Awesome! I was a little leary about using the carrots and parsnip but it was the best tasting stuffed cabbage I have ever had, Thank You for Sharing. Yes–re: Jewish version with raisins, etc. I remember my mom’s was a bit sweet too-she was Czech and she knew lots of Jewish recipes. Anyone else remember a slight sweet version? Gingersnaps! That’s the secret ingredient in my mother’s stuffed cabbage, crumbled and added towards the end, along with vinegar and brown sugar. Susan on February 21, 2013 worked on a recipe that is similar to the one my mother always used – if you call it a recipe. It’s a little of this and a little of that and is always delicious. Trial and error on the quantities…This freezes very well and is fantastic on a cold night. I love Russian/Ukrainian food, but usually when I make Russian dishes, they don’t taste quite right. At last, at last, I have made golubtsy that tasted right! My Russian husband loved them. Thanks so much for this recipe. I was reading the history of cabbage rolls (yes they are historical), and they were spread by the turks (ottomans and other empires) all over eastern,western europe, russia, etc. Variations came about by region, ethnicity, religion, and local dietary laws. Christians included all sorts of meats like beef, ham, sausage, veal, etc. Jews used only beef, veal, and sometimes lamb. Polish or hungarians might have different recipes due to jewish or christian etc. Many cultures referred to them as doves or little pidgeons, or pigs in a blanket in their local language.Greeks eat stuffed grape leaves and I am sure there is a relationship. Do a (google, bing, internet explorer) searchon them or other “ethnic” foods. See if your background used that dish during religeous holidays like Simchas Torah for Jews or Easter for some Christians. I didn’t read this, but assume, since spread by Turks, that Muslims must have a version (no pork, like the Jews). Hi Buzz — You might want to see my newer post on cabbage rolls, where I talk about versions from all over the world. We (Russian) cooks prepare this dish for every holiday celebration. hi Deb! First time poster, long time reader. I just tried this recipe and it received rave reviews. However, the rice was, at best, half cooked. Since the recipe specifically called for uncooked rice, and there was no instruction to cook the rice separately, I put the uncooked rice in the meat mixture. Is that correct? I used brown basmati rice…perhaps that had something to do with it. What type of rice do you usually use/ I also forgot to add the tomato paste to the meat mixture, which may have contributed. There was plenty of liquid for the rice to absorb, though. What do you think? Meaghan — It was the brown rice. My MIL just uses white rice and it cooks quickly. I should have made that more clear. Hopefully you can put it back in the oven for a while until the remaining rolls cook their rice. I love that you have a Russian section but oh how I wish it were longer! My mother didn’t cook particularly well so I’ve missed out on actually learning any Russian recipes from her and now don’t know where to even begin (or what things are called! Or what they should taste like!) are there any other Russian dishes that your mother in law frequently makes that you’re a fan of? I wanted to do an all Russian dinner but got stuck after borscht for menu options! Any suggestions on great dished hugely appreciated! I, too, LOVE stuffed cabbage. The recipe I was raised with calls for strictly ground beef but I now use a beef, pork, veal mix – I love the texture as well as the taste. Last time I made these, I used brown rice which I cooked in the water the cabbage was softened in, and then mix with the meat and veggies (the brown rice worked out well!). I bake mine in the oven in a foil covered deep dish for about an hour. Once I pull them out, I drain off the fat and add the tomato sauce which is made sweet and sour with fresh lemon juice, lemon zest, and brown sugar and back in the oven – uncovered – they go. If making ahead of time I’ll wait to add the tomato sauce. Wonderful childhood memories surrounding these! My mom always lined the bottom of the pot with beef neck bones. The cabbage rolls never stuck or burned. The sauce was tomato sauce and beef broth and becomes my husband’s favorite soup after he eats all the cabbage rolls! thank you loads for the recipe!!!! didn’t realize how simple it can be and sooo DELICIOUS! whew- i’ve always loved you smitten kitchen- your recipes never fails me! HUGS! This was my grandmother’s “tender” nic name for me when I was growing up. Good recipe though! Congrats on your excellent book! ooops-forgot to mention we had these at my wedding. No cake for us! We are a hardy folk! These are called “gołąbki” in Polish. There exist a lot of gołąbki varieties here. Those with meat usually call for beef, pork, veal. The stuffing contains ground meat and rice although old recipes require kasha (buckwheat, barley). Vegeterian versions are stuffed with groats mushrooms or potatoes. Delicious! Made this for my Czech husband almost as written except used half ground beef/ground pork, added some garlic to the sautéed veggies, essentially doubled the recipe, and added a few allspice berries to the sauce as it simmered (I recommend fishing them out after as biting into them is a little unpleasant). Thank you for another great recipe!! I have always made these by cooking the meat, onion, spice mixture BEFORE adding it slightly cooked rice, to which I add a bit of the tomato sauce. Then I roll ’em, sauce ’em and bake. This may be a sacrilege to some but it has always yielded a very tasty result and you can taste the mixture before mixing with the rice (which is still slightly hard at this point). I would love to know if anyone else had done it BOTH ways and finds one superior to the other…..I am not too old to learn! The first time I made these, I completely misread the recipe: ‘turnip’ for ‘parsnip’ and ended up substituting daikon radish for the supposed turnip. It was delicious, and I found out that there’s no local grocer selling parsnips anyway, so I’ve made it that way since. As an inveterate ingredient-substitute-er, I’ve made a few other discoveries, too: It’s better with white, long-grain rice rather than the last bit of your bag of calrose or nishiki, which tends to get mushy and lose integrity when reheated in the sauce. Also, regular green cabbage leaves work just fine. My first attempt at making them last night, even though I come from good Ukrainian stock. If my grandfather were still alive, I think he would have been proud. And…these were super tasty. I’m not the biggest fan of raw cabbage, but have been getting it in my CSA (with, I am sure, more to come), so I am glad these were so good. And I even forgot to add the celery and the tomato paste! My only problem was that they kinda ballooned in the pot and a couple fell apart. I think next time I may try baking them instead. And I don’t think I blanched them enough – they weren’t quite as wilty as I think they should have been for rolling purposes. But great base recipe! I have a couple turnip that need used – another veg I’m not overly fond of – so if I get another cabbage, they are going in! Thank you so much for this recipe. Just made it earlier today as it has been very chilly here in Chicago recently. I never thought I would eat so much cooked cabbage. I made this for a work-related potluck last night. I had never made anything like them but thought the individual servings would be perfect for a potluck. My wrapping technique needs work, but I dug deep into my little-known Polish heritage and… my coworkers sang praises. My boss said, “They were delicious. I kept thinking, ‘my grandfather would have LOVED these! '” Another coworker, a former chef and dear friend whose face I kept imagining as I fretted over the loose wrappings, said “It’s not a potluck til someone brings the cabbage rolls. They were GREAT!” My coworkers are obviously not your typical southern church ladies, but still… #Winning. Thank you, Deb! This recipe is still winning converts. I wanted to recreate my Slovak mother’s halupke and used this as inspiration. I also read through all the comments (obsessed much? ), and added a few things, like the crushed gingersnaps. A total success. Also, I am firmly in the freeze your cabbage camp. Made these tonight. Absolutely delicious. Perfect enough to serve to my Russian mother-in-law. Thank you, Deb! The occasion of your mom’s birthday represents a unique opportunity to express your love and appreciation for all her sacrifices and belief in you. A photographic how-to-roll the leaves guide would be most welcome. I have made this recipe a few times and it is always delish, but I’m not confident I’m rolling them right. Do you think you can do this with red cabbage? I got a whole head from a CSA and I don’t know what to do with it (besides make cole slaw) — and this looks so delicious! I somehow messed up working with the cabbage. Maybe it’s because I used a purple one? The leaves all broke when I tried to peel them off…. So instead, I simmered the meat and rice mixture in tomato sauce and it was delicious! I ate leftovers the next day and it was even better. I do hope I can get the cabbage to work out next time. Did you cut out the core of the cabbage before steaming? It helps to pull off the leaves. I boil the head of cabbage first. Also, ketchup mixed with a little water makes a very good sauce. If you brown the filled “cabbage rolls” in a pan with oil, they taste even better (in my opinion). My mom fills them like a Swiss roll, just a thin layer of stuffing, then roll them up – and brown them nicely in a pan. The browned cabbage has a different taste, I love them like this. But then, they are not cooked in tomato sauce afterwards, so it is really a totally different recipe :-D You can eat them just like that, with a salad. I am Armenian and grew up eating my mom’s golubtsy (beef/pork/white rice filling inside of grape leaves or steamed collard greens), but I used this recipe in my first-ever attempt at making golubtsy. So yummy! Maybe I’m weird because I love the slightly stinky smell of cabbage cooking, but I absolutely loved how these turned out. I’ve since made my mom’s version(s), vegetarian versions (mushrooms/carrots/brown rice), grape leaf and collard greens and kale wraps, and a few interesting hybrid versions, but this version is still very high up on my list of must-makes, especially as a hearty winter dinner. OK = I’m very late to this party, I know. But I came across a simple idea that makes it quick and easy to enjoy the stuffed cabbage flavors with less than half the effort, no dripping counters, scalded fingers and bad language when the cabbage leaves tear. 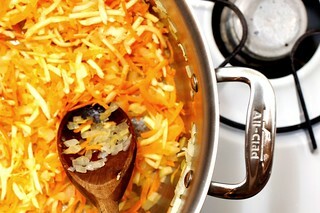 Shred the cabbage, blanch it quickly for a minute in boiling water, and layer it in a baking pan with the meat sauce. Bake at 350 till everything is hot – say 30 minutes. Cover with foil at first if it looks dry, uncovered if wet. That’s it! Any changes if you use regular green cabbage? Can’t find Savoy cabbage. Cathy — I’ve actually never made stuffed cabbage with it. I suppose if you blanche it long enough, it will become floppy enough but I can’t give more help without try it. Cathy- I use purple cabbage. And although the rolls don’t come out perfectly, they’re more like cups, i don’t even cook the cabbage first. Still delicious! Sounds fabulous! Would you have this as a complete meal, or what would you serve on the side? I mean, we sometimes have salad too but I definitely think this can be its own meal. The minute I saw these, I knew they were authentic. My mother used to make them and I still remember the tell-tale “cooked cabbage” smell coming from the kitchen. I can’t wait to try them..they are very, very close to my mom’s. Four days is “quicker” for the cabbage? I have always made my cabbage rolls with cooked rice. I would assume uncooked rice would double in size and burst the rolls during cooking. Does everyone used uncooked rice? I assume quinoa would work fine, and also couscous. My mother-in-law uses uncooked rice (although this is not the place for brown rice or anything that will take much longer, unless you give it longer). It doesn’t expand that much or break; mostly it keeps the filling from being too watery. I use cooked rice and so did my grandmothers and mom. My mom often made these with buckwheat instead of rice or a mix of buckwheat and rice. Both good! Sounds delicious. Never thought to use parsnips, that would give the cabbage rolls quite a different flavour. Any chance I could do these in the oven. I’ve been desperately trying to find a recipe like my Mom did and this is close. I don’t really have a suitable stove top pot and I prefer using the oven but if you don’t think I should I will make do. Also does it have to be a Savoy cabbage ? I know nothing about different kinds of cabbage. Savoy cabbage has the stretchiest, most pliable leaves. If you see it, you’ll see it has deeper ripples and so when softened with water, it wraps well. I am sure people use regular cabbage too, but imagine it needs more time to soften/may not wrap as easily. I definitely think you could braise this in the oven. Maybe in the 300 to 350 range for an hour? I use regular cabbage and cook these in the oven (covered in a Dutch oven) and they are DELICIOUS! This is a very similar recipe to my mother’s, except she had a bit of a fetish with caraway. She put caraway in everything. It was a bit out of control. Her family is German. I’m interested to see that it is so much like the Russian version. You can avoid steaming the cabbage in advance by freezing the whole head of cabbage and then defrosting at room temp. It’s way less work and mess that way. I am going to make these tomorrow and try cooking in a slow cooker for 6-8 hours on low. Other recipes I have seen suggest a slow cooker, so it seems like it will work using this recipe too, no? Has anyone attempted it? do you cook the beef before or does it cook in the cabbage roll? It cooks in the cabbage roll. Thank you so much! I am trying it with lamb this time and LAST TIME I made it I cooked just a little because I wasn’t sure. Huge fan by the way! Ever made this in the slow cooker? I think it’d work fine…just curious if you have tried it. Thank you! I make this at least twice a year. It’s one of my husband’s favorites and on his list of requested meals. His mother made “pigs in a blanket” and his ex girlfriend made “pigeons”. Thanks for offering your family recipe, that I call me own. This is delicious, but I’m too lazy to make the rolls (I tried it once and took way too long). I now leave out the rice, chop the cabbage, simmer the whole thing on the stove until it’s done, and then serve over rice. Tastes the same to me! You can change any ingredient and it’s still will be tasty. I tried all kinds of varieties in my childhood. With rice, buckwheat, with meat and without it. My grandmother even cooked the rolls with grape leaves instead of cabbage. Quite interesting option, I like even that more than the usual recipe. This was just weirdly great and satisfying comfort food. I omitted the parsnip, just added a bit more carrot. I did try the trick of freezing the cabbage and then thawing it ahead of time, but still ended up needing to pour boiling water over anyway, as it does a great job of separating the softened leaves. I used green cabbage and the leaves were soft enough that I didn’t bother removing the ribs, and they rolled easily and held up well. I added a few good dashes of cinnamon, nutmeg and allspice to the meat mix, and I only had jasmine rice. I used a jarred pasta sauce but I wish I’d just used plain canned tomato sauce to let the other flavors shine more. While it was cooking everyone was gushing about the smell. I always thought that was supposed to be a bad smell. I followed this recipe exactly and the cabbage rolls were PERFECT. That has never happened to me before as usually I feel like I need to tweak it a bit, add something, take away something…But these were just right, delicious, and my family loved them. I will be making them again. Thank you!! I trained in France and we ALWAYS tested the seasoning of “farce” or ground meat stuffings and sausages by cooking and tasting a tiny bit.